A Site Options and Assessment (Aug 2016) by AECOM (an expert planning consultancy delivering technical support awarded to the Parish by Locality, a programme partner of the Department of Communities and Local Government – DCLG) noted the next best performing of the sites in Plaistow, after Todhurst, when taking all relevant criteria into account, was ‘Land Adjacent to the Dairy’ which was subsequently brought forward for incorporation into the Neighbourhood Plan by the Parish. The site benefits from being in very close walking distance to the following village facilities and services which include: a Church, primary school, store with coffee shop, pub, village hall (Winterton Hall – with a Youth Club, a pre-school that has a dedicated outdoor playground, weekly post office services dispensed in the Youth Club – to the rear of the hall and an outdoor multi-use games area); a village green; a recreation ground with a pavilion (formerly a cricket club) and an outdoor childrens’ playground; and a football club with pavilion. However, after further investigations, evidence demonstrated that the impact of providing an access to this site would result in potential harm to significant trees and the hedge adjacent to the road verge. Such an impact would be harmful to the setting of the Conservation Area. At a meeting of the full Parish Council (17th Jan 2017) the councillors present considered an update from the Neighbourhood Plan Steering Group. Since the last update, a CDC HER search (Historic Environment Record) was carried out on the The Dairy site, which did not highlight anything significant. An Arboricultural Impact Assessment (AIA) [AIA Report and Tree Constraints Plan] was also carried out, the purpose of which was to evaluate the direct and indirect effects of proposed development on trees and hedges on the site, and where necessary to consider appropriate mitigation. The report states that four ‘A’ grade trees (T1, T2, T4 and T5) are of high value, two of which are located adjacent to the frontage on The Street. Technically an access road could be created but would have to be a low impact, no dig access which is not deemed suitable to service a development of 11 houses requiring a road constructed to Highways adoption standards. The landowners of The Dairy site advised that there is a potential alternative access further South, although the land over which they have private access rights (for field maintenance) is not in their ownership and is also a Public Right of Way (Path Number: 633; Type: Restricted Byway). 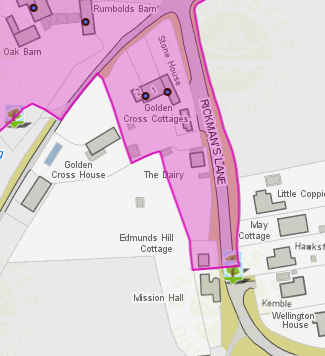 The possible secondary access point is located between two properties (Mission Hall and Chumleigh – formerly known as Kimbers) on Rickman’s Lane. Therefore the Parish Council agreed that it was for the landowner to demonstrate viability of the site in relation to access and they would be given the opportunity to provide this information by the end of January 2017 this was extended as a courtesy into February. It has since been confirmed that the land needed for access into The Dairy site is owned by the National Trust. This therefore becomes an issue of whether development of the site is achievable as The Dairy site landowners must obtain agreement from and then negotiate with the National Trust for access over that land and in a timely manner to permit the Parish to deliver on its housing allocation according to Chichester District Council’s Local Plan, their Site Allocations DPD and to meet their five-year housing supply. Consequently, there are doubts over the deliverability and achievability of The Dairy site. Therefore with reference to the Parish Council’s decision, NPPF paragraphs 021 and 022 and Planning Practice Guidance, the achievability of this site could not be considered deliverable over the plan period and the site was discounted. 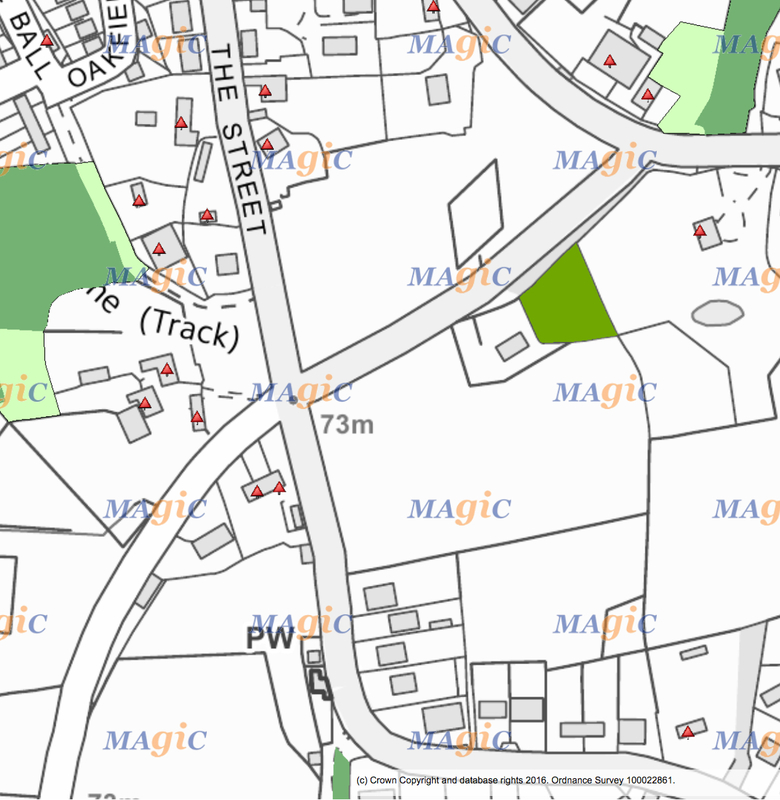 Map National Trust Boundary – Potential access point between the properties Mission Hall and Chumleigh (formerly known as Kimbers). Photo 09: Sight line on highway (30MPH) towards Plaistow centre, The Dairy is on the left. Possible point of alternative access into The Dairy site.